I would like to give a warm welcome to Amber Daulton a guest with Critters on Tour. 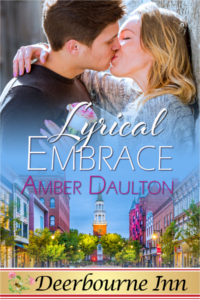 She’s here today to showcase Lyrical Embrace. What impression do you make when a person first meets you? I like to think of myself as a normal guy, and I hope I portray that to the people I first meet. I used to perform in an indie rock band, but the band never made it big, so most people who aren’t involved in the New York music scene doesn’t recognize me. I’m grateful for that. I’ve moved back home to Willow Springs, Vermont, so I usually don’t meet clubbers and fans anymore. Losing Erica. She’s been through a tough time, and I love her like crazy. Her ex-boyfriend came around a while back and threatened to kill her—to kill us. God, I don’t even like thinking about that. If I lost her, I don’t know what I’d do. I’m an ex-professional drummer, and now I’m a music teacher at my parents’ school, Haynes Music Academy. I love teaching kids how to play instruments, and I feel pride in their success. I’m also a volunteer fireman. After so many years of partying and having fun, I wanted to do something good and give back to the community where I’d come from. Being a fireman and EMT helped me accomplish that goal. What skill do you have that you’re proud of? Why? I’m a helluva drummer, but I can play almost any instrument. Music has been my life since I was a little kid, and I can’t see my life without it. Erica is perfect for me. She’s strong, beautiful, and stubborn, but vulnerable too. She’s an excellent violinist and loves music just as much as I do. After all the crap she’s been through, she’s still trusting and kind. She loves with her whole heart, and I’m damn glad she picked me. What trait do you like most about the person you fell in love with? Erica’s strength and her ability to not let life get her down. She’s the type of woman to get back on that horse after falling off. I couldn’t be prouder of her. Amber lives in North Carolina with her husband and four demanding cats. Feel free to visit her at her blog.